The University of Guelph “Community Hero” award(s) program started in the fall of 2016. These awards recognize any citizen in Guelph who is a role model for community outreach, service, volunteerism or life-saving efforts in the City of Guelph. 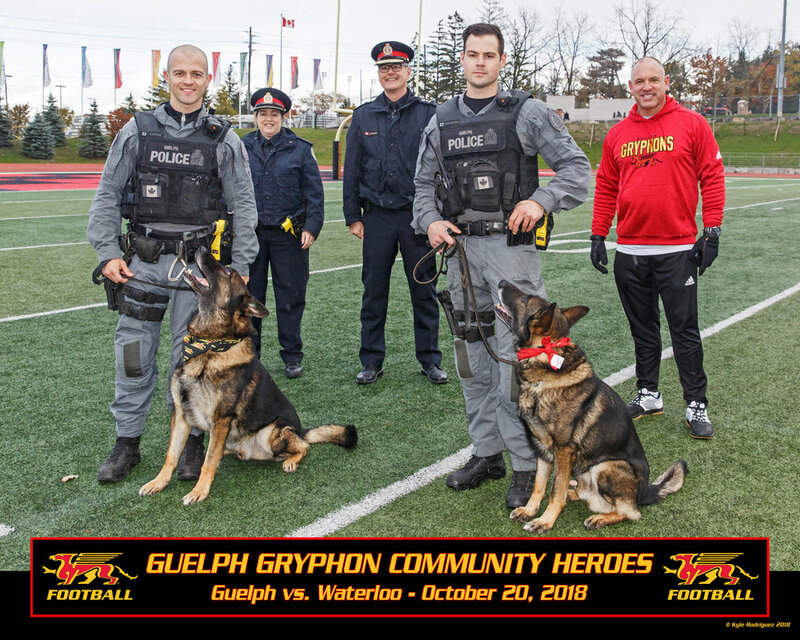 The awards are given out during each Gryphon Football Home game to highlight and thank the individual and or joint accomplishment(s) of some of most giving citizens for making our community a better place to live, work or play. If you know of a deserving candidate for recognition, please email Douglas Pflug at Douglas.Pflug@Ontario.ca with the details of your nomination. From left: Konrad, Shai, Scott McRoberts (UofG Athletic Director), Konrad, Justin. From left: Carter Scheffold-Higdon (brother, in orange), Carla Scheffold (mother), Scott McRoberts (UofG Athletic Director), Morgan Scheffold-Higdon (Community Hero), Ron Higdon (father), Doug Pflug (Gryphon Football Community Contact), Cst. Sherry Pettapiece (Guelph Police Services), Head Coach Todd Galloway. From left: Kayla Billings, Scott McRoberts (UofG Athletic Director), Margaret Stinson, Marissa Teeter, Misty Gagne, Doug Pflug, Alina Kislenko, Kevin McNeil, Isobel Boyle. Franco Vaccarino (UofG President), Scott McRoberts (UofG Athletic Director), Gryphon Turner, Cameron Turner, Mike Farley, Shawn Turner, Paul Turner, Mark Cullen, Doug Pflug.